The following information came from my aldermen. Seventh district aldermen Lisa Mellone and Renee' Lowerr are holding a district 7 information meeting at City Hall on Wednesday, Sept. 24th, at 2 different times: 2-3 pm or 6:30 - 7:30pm. Download document "Methods for Improving Stormwater Drainage, Reducing Flooding, and Minimizing Basement Backups"
Important blue bin reminder; Paper must be separated from bottles and cans. A free blue recycle bin can be picked up at city hall. One of the things I love about living in our City in the Countryside is the variety of wildlife here. Last year, it was not unusual to see a Red Fox or the entire Red Fox family out and about in our neighborhood. This year I saw a coyote in my back yard. Birds also abound here. When the fruit trees are in bloom and when mulberries are ripe, Baltimore Orioles are regular visitors to my yard. Hummingbirds frequent my perennial flower garden. I love it! Kinsey Park pond (at the end of my street) often has Blue Herons fishing at the pond's edge. It is fascinating to watch them. But Monday, for the first time, I saw a Green Heron. Two girls who were frogging at the pond edge said they saw it there last week too. by flying out from the weeds at the edge. At first I did not know what kind of bird it was--it did not seem large enough to be a Heron. Maybe a Kingfisher of some sort? Once back at home I got out my trusty Audubon bird field guide and narrowed it down to the Green Heron. 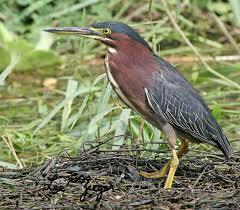 I also read that suddenly flying out from a weedy water's edge was a characteristic of Green Herons. But what about the long neck? A look on the internet confirmed it. Cornell Labs All About Birds site explained that Green Herons often held their long necks close to their bodies. That clarified why the photos showed a short, stocky neck, but the actual bird had a long one. The Great Blue Heron's may have been in the news lately, but don't forget to look for the Green Herons too next time you are near a pond or wetland. After all, Brookfield's wildlife is one of the perks of living here.